OK, maybe it isn’t all work work work in the office. 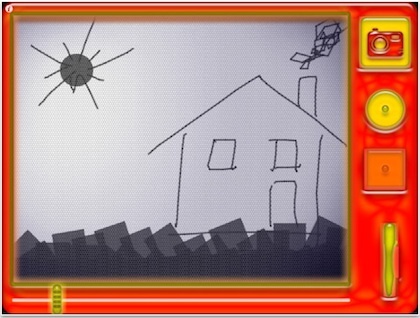 From time to time you have snickers from down the hall and folks start yelling out “good one”, “did you see the one I posted?” In today’s case, the chatter started as soon as folks found out that the Magnetic Drawing Board app was FREE today. The app is universal so drawing can be on both the iPad and the iPhone. Simplicity is key in making this fun on the iPad. You have a clean slate to work with… much like the blue one handing on Joey and Chandler’s door in the old Friends TV series. Except, in this case you can choose squares or circles to draw with, the original mechanical device had one or the other depending on the manufacture. When done, just slide the bar along the bottom to clear off the drawing bits. The added bonus of Magnetic Drawing Board being an app is the ‘camera’ button that lets us share our low resolution creations with others via the creation of an image in the iPad’s photo library. Free retro fun today!